The oil has not reached the “sugar-sand” beaches of the Florida Panhandle yet, but the fear has. All along the Florida Gulf Coast booms are being readied and occasionally deployed. The state is carefully monitoring water quality looking for even hints of petroleum. So far, Florida has been lucky. Prevailing winds have pushed the spill offshore and towards the west. 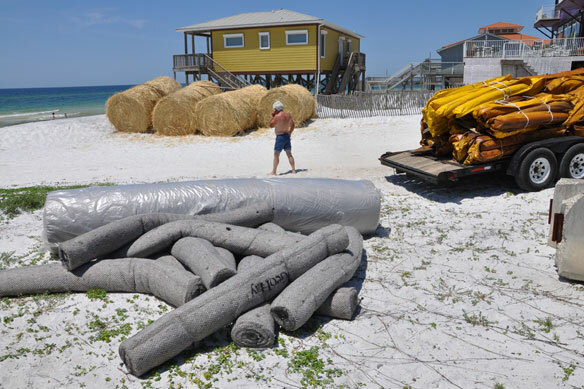 Bad news for the wetlands of Louisiana is, unfortunately, good news for the tourist beaches of Florida. Local fisherman report that they have travelled 60 miles offshore and seen nothing. Yet, for many families planning summer vacations, the uncertainty is too much to take. Local newspapers around the Panhandle report significant cancelations for summer cottage rentals, hotel rooms, and even weddings. The economic impact of the spill is already being felt here, even though the oil has not arrived. In Louisiana, local officials and the Governor’s office are proposing to build a 70 mile-long artificial sand barrier by burying some of the existing barrier islands and outer wetlands with sand and mud dredged from the nearby Gulf at a cost of $250 million or more. There are many in the state who have wanted to do this for a long time to provide some degree of storm protection. Many of the areas they plan on burying are federally protected lands and critical habitat for a variety of species. I understand the desire to “do something” since BP is having no luck shutting down the flow of oil, but I question anyone’s ability to this the right way without any planning or detailed investigation. What are the chances that even a well-intentioned effort to block the oil may do more harm than good when we still have no idea where the oil is going? Pretty good. Meanwhile, NOAA’s latest 72 hour projections show the oil shifting back towards the east and the north. Everyone here in Florida feels a looming sense of dread. At the moment it is beautiful—paradise. But everyone is wondering if we are on the cusp of the greatest economic and environmental disaster to hit the state. At the moment, all we can do is wait and watch.